Today was one of the first times all year I left the office and it was still light out. It may have been 40F degrees outside, but the light made all the difference. 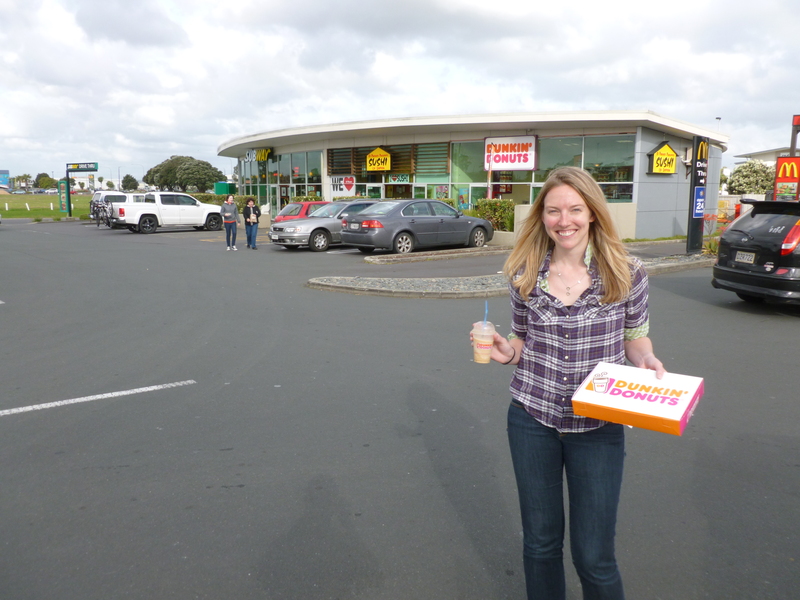 5 minutes after leaving car rental central – make a dangerous left hand turn in the name of Dunkin Donuts. As a Massachusetts native I am quite passionate when it comes to my Dunkin. There are no DD’s on the south island and only 7 on the north island (yes, I have asked). 8:30pm – Had to deal with some traffic–things we’re not used to living on the south island, but finally made it to Rotorua within 4 hours. 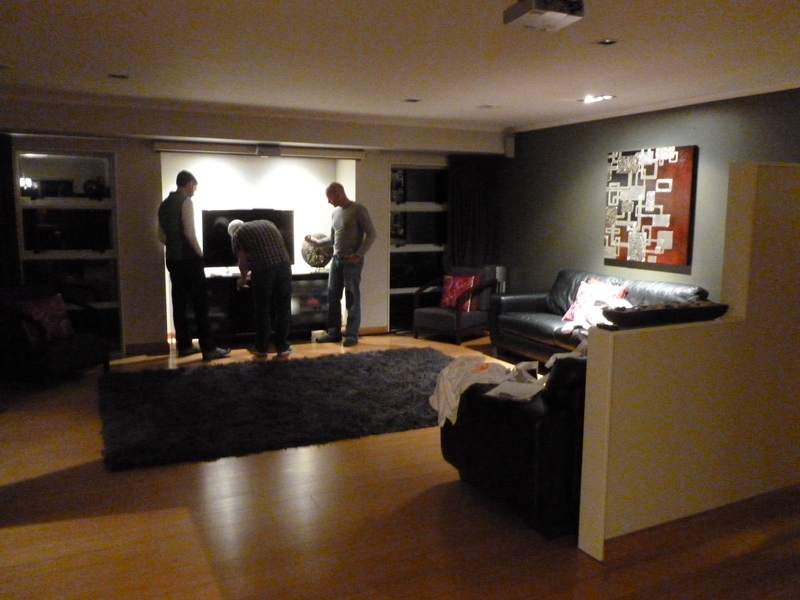 We rented a “bach” (fancy name for a vacation rental in NZ, can be anywhere from a cabin to a mansion, see http://www.bookabach.co.nz ) which consisted of 5 bedrooms, a whole lot of beds, and a flat screen t.v. with optional projector and 100″ projector screen. 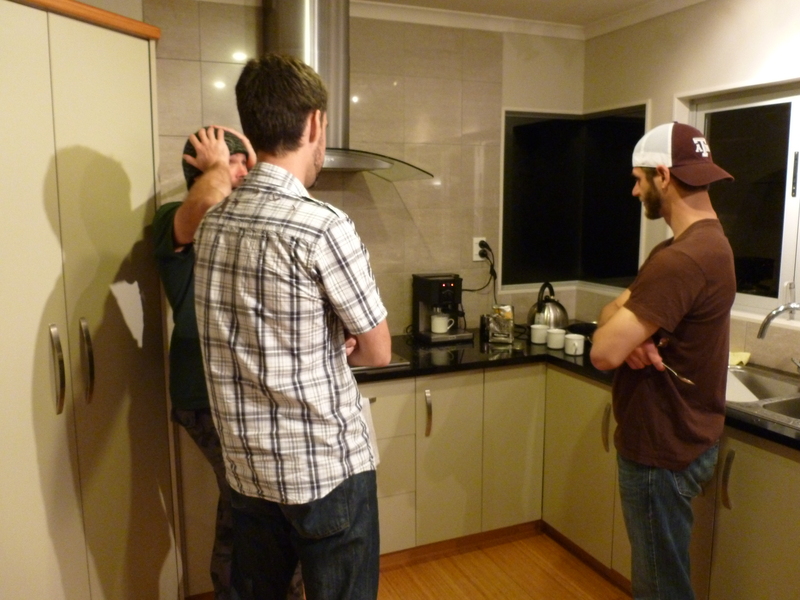 The men instantly gravitate towards the video game system. 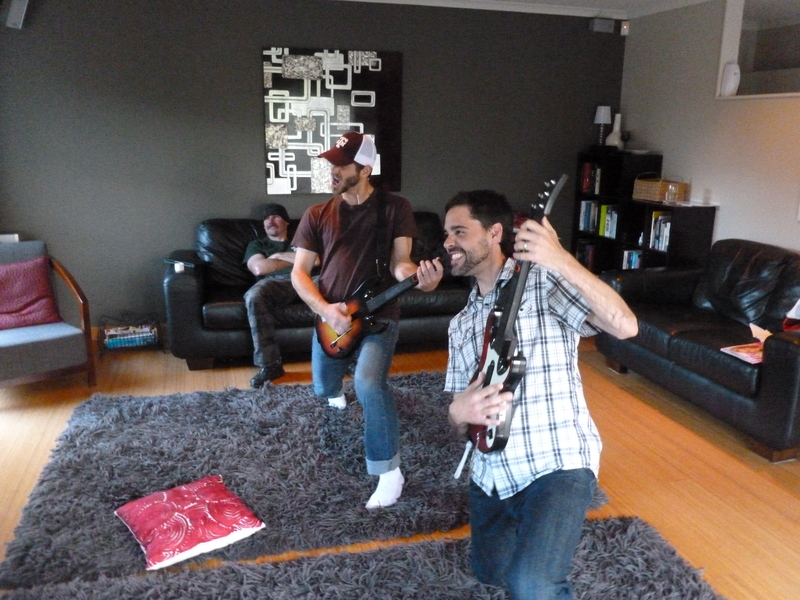 Rock band…check. 9pm – Pre-race meal–pasta, chicken, pesto, salad, and ice cream. Enjoyed the luxury of sitting at a large dining room table and cooking in a big fancy kitchen. Pre-bed: As weekend organizer, I may have looked a bit geeky with my clipboard. 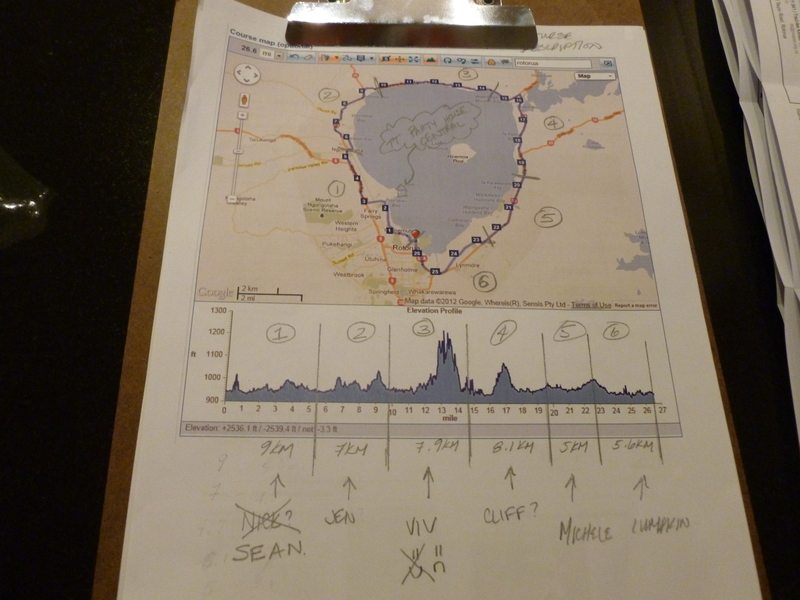 However, we were easily able to review who was doing what leg and keep everything in order for the long day ahead. 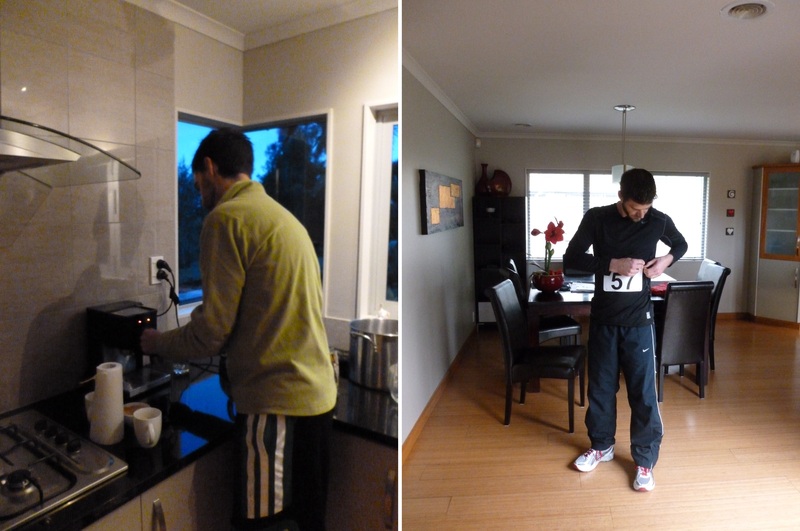 Saturday, Race morning – we prepare for the day by learning how to work the in-house espresso machine (most residences in New Zealand own one of these), and doing some last-minute adjusting of our bib numbers. “Is this level?”–statements that make us realize we’ve been assessing earthquake damage for far too long. 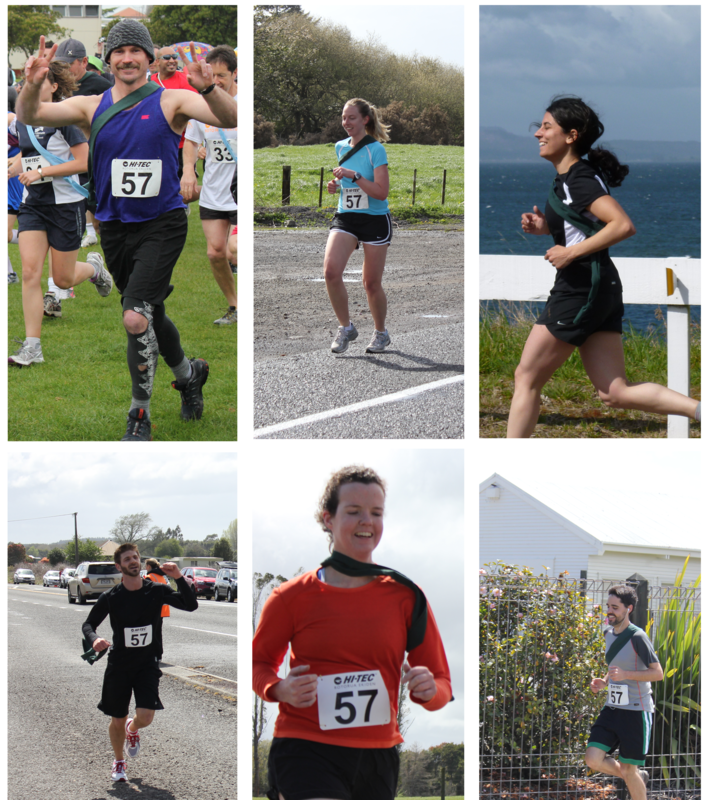 9am – the race begins! What a fun way to spend 4:01 hours–rushing around a beautiful lake, getting some exercise, and cheering our teammate on driving around in Shamu. 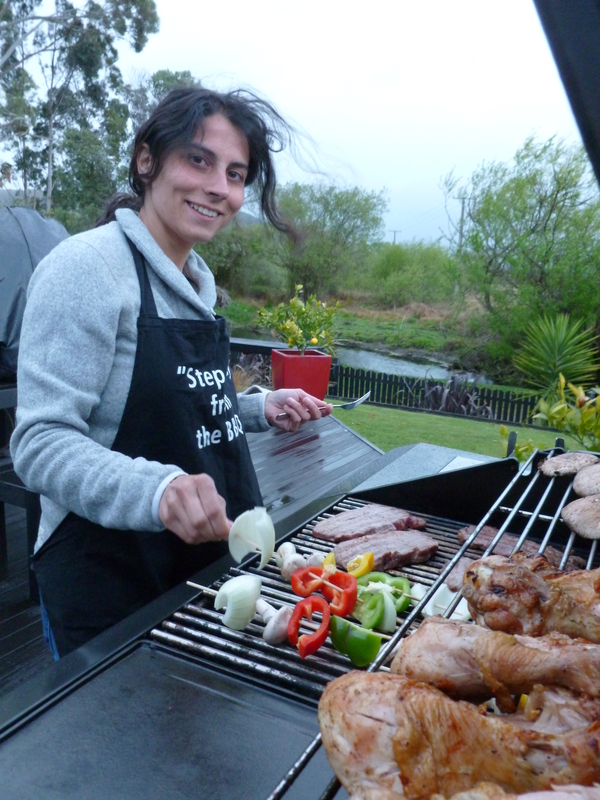 Post race – after an exhausting morning we headed back to the bach and grilled up a fantastic dinner. 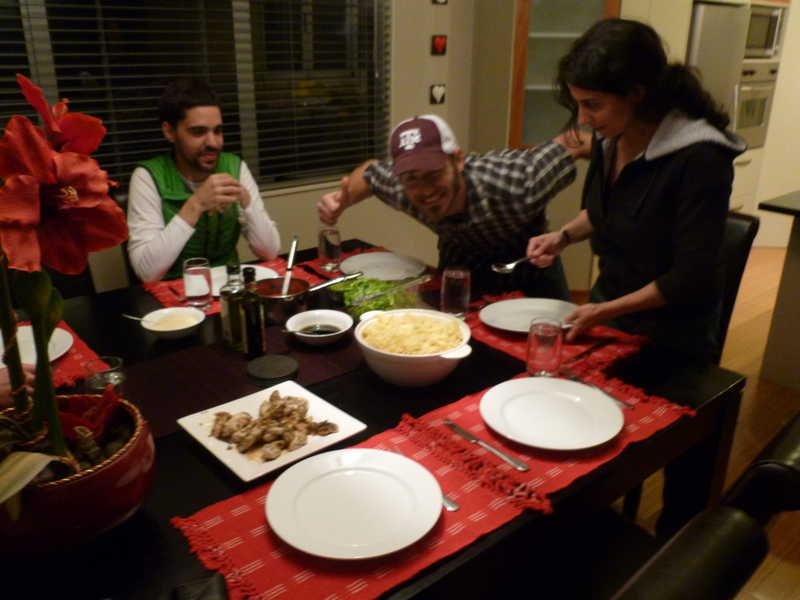 As much as I’ve enjoyed exploring several NZ eateries, we’ve found that we tend to make the best meals in-house. Sunday morning – cooked up a big breakfast and checked out the lakefront right in our backyard. Before heading back to Auckland airport – Rotorua is a bit of a tourist town (also known as “Rotovegas”), we attempted to drive a bit out of the central city to check out the more natural tourist traps. 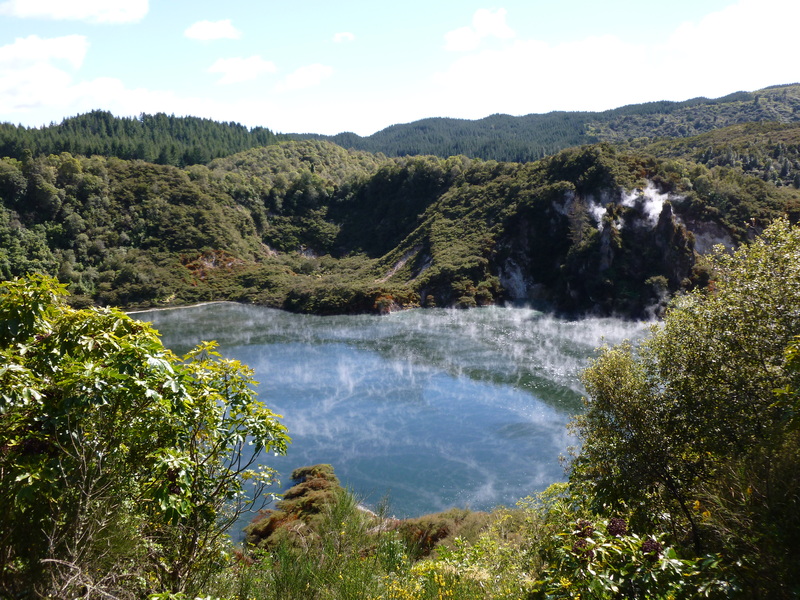 We ended up at the Waimangu Volcanic Valley–home of the world largest geyser and world largest hot pool. It was quite a beautiful hike (despite us all being a bit grumpy that we paid $31 for it). Here I’m standing in front of echo crater – a geothermal pool that continually rises and falls. This day the pool was low and a “cool” 40 C, in a few days it would rise in temperature and elevation and overflow into the nearby lake. 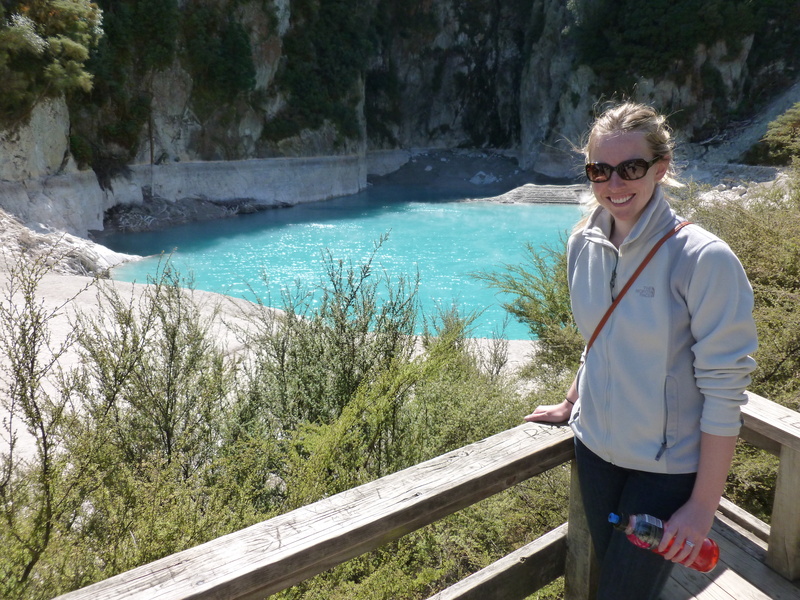 Overall a really fun weekend and great excuse to check out another city in New Zealand. 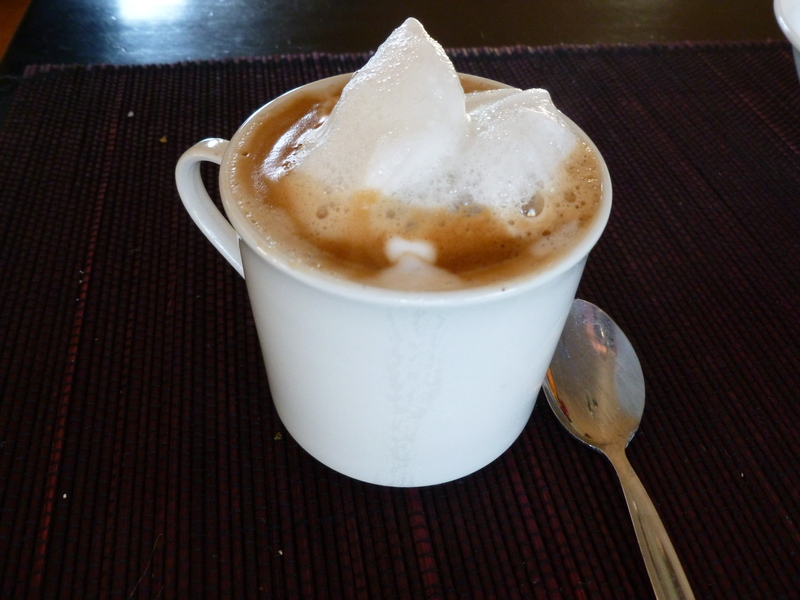 I leave you with my coffee photo of the week – my first homemade flat white. I believe you can tell that it was less than perfect; however, still tasty. We even managed to sneak in the background of one of the professional photographs of Keith along the course….at least we think we did. You can attempt to be the judge. Apologies for not updating 24/7. I must say it was surprisingly easier to blog at least once a week at WPI when I was working on senior project, crazy classes, crazy grad classes, plus involved in a million things. Now I seem to be busy with just Cornell grad classes…lame. So what has happened of late? 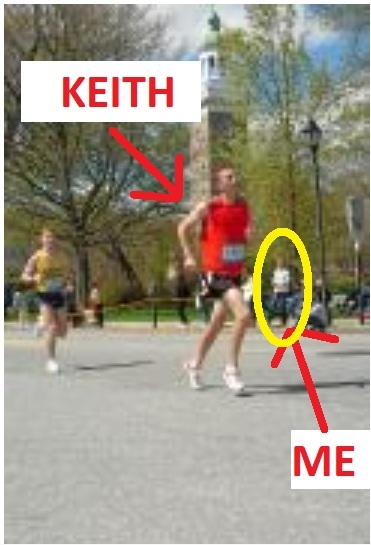 Well, I went back to Massachusetts last weekend to watch Keith run a marathon. It was amazing. I never knew spectating someone run 26.2 miles could be so much fun! (well, definitely more fun for me than it was for the members of Keith’s family running!) 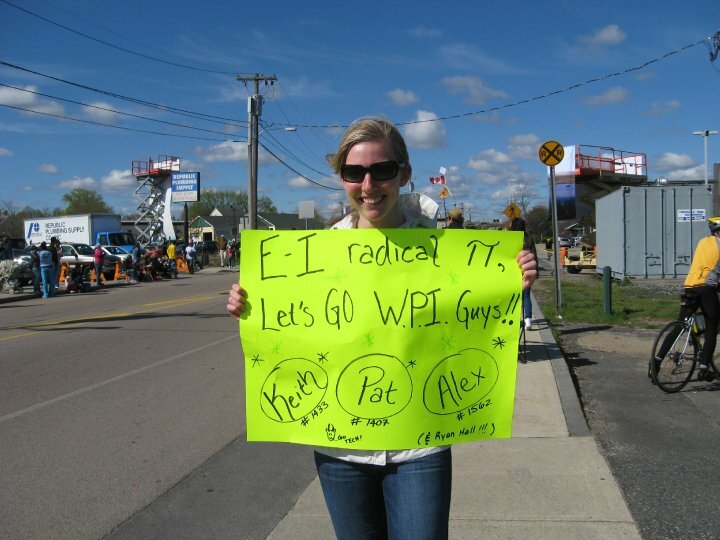 A bunch of WPI friends came out and we basically just drove around the course the whole time, cheering Keith along key points throughout the run. He managed to finish around 2 hrs 46 minutes. Quite the feat! Although he couldn’t walk at the end, he was still a great trouper and stood outside for a while after a hot shower to wait for his sister to finish. As for this week, schoolwork hasn’t been toooo stressful. I’m ready to just plow threw this weekend and next week with work and enjoy going back home (yet again) for homecoming. I promise I’m not like “that” loner kid from freshman year that never hangs out at school. Two important MA weekends just happened to come up at the same time. I must say it is nice to be back in civilization for a while, even if it is only for a weekend. Hopefully my ’92 Honda Accord won’t hate me for the milage it will be getting. I think I may have gotten quite used to the scenic 6 hr drive–especially in the autumn season. So on to plowing threw the weekend. Which includes our 1st structural engineering intramural volleyball practice. Yes, we have an intramural volleyball team, no I don’t know how to play volleyball, yes we have a nerdy name like “The Whitney Stress Block”, but we will still be awesome. First game Wednesday! Updates to come!